After working for Thomas Keller at his restaurants The French Laundry and Per Se for almost a decade, Corey Lee struck out on his own in 2010 with Benu restaurant in San Francisco's SoMa district. Corey Lee had already earned his spurs as Chef de Cuisine at The French Laundry for 5 years, and he quickly climbed the Michelin ladder with his own restaurant. 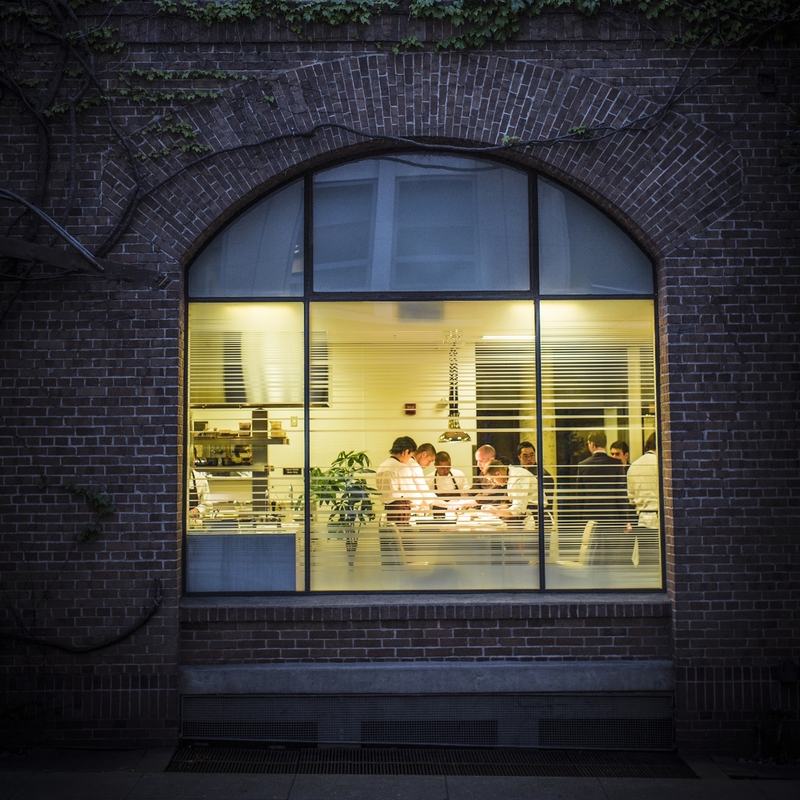 Benu debuted with two Michelin stars in the 2012 guide and three years later in October 2014, the restaurant was awarded a third star. Korean-born Corey Lee (b. 1977) moved with his family to the United States in 1982 and in 1995 he started his career at sushi restaurant Blue Ribbon in New York City. Before moving to California in 2001 to work for Thomas Keller, Lee trained in a number of restaurants in New York City, Paris and London. Benu is open for dinner Tuesday through Saturday and offers a set multi-course tasting menu (around 17 courses) priced at $228, excluding service charge. I had dinner with my husband at Benu on Thursday 2 April 2015. First course of the tasting menu was "Thousand-year-old quail egg, potage, ginger". A dish based on the same traditional preserving technique as used for so-called century eggs, also known as "Pidan". Eggs are preserved by marinating them for weeks or even months, in a alkaline-rich solution that often includes strong black tea or tea leaves. The marinating transforms the egg white into a brown gel-like texture and the yolk also takes on a different colour but still retains some yellow in the centre. Benu marinates the quail's eggs for 12 days and then lets them age for 4 weeks. The eggs are briefly cooked before serving. 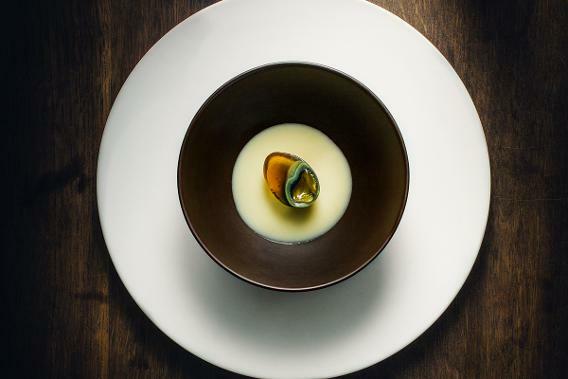 The outcome is half a quail's egg, served in a warm and velvety potage with a spoonful of mildly sharp ginger cream. 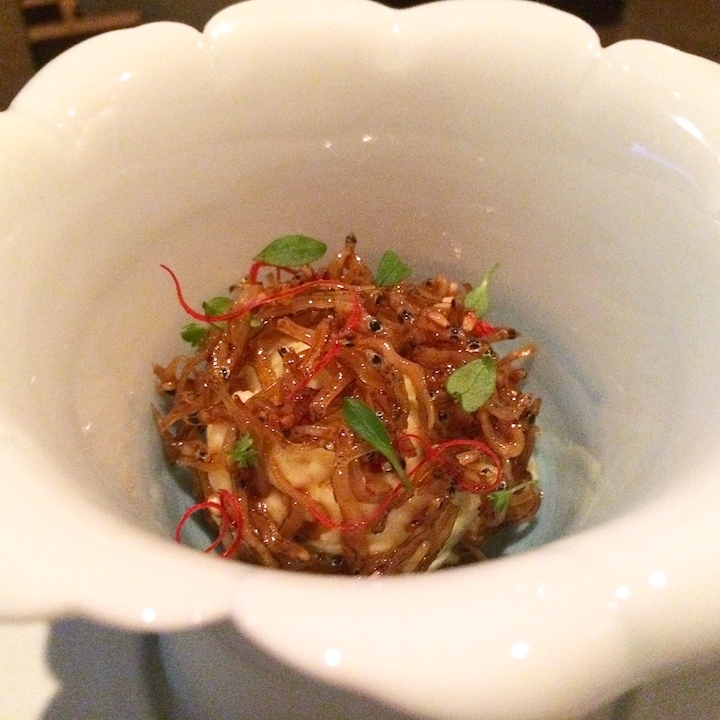 Certainly not your average start of a tasting menu and the Pidan was a first time experience for me. A lovely flavour combination and I enjoyed the mouthfeel of the egg. Second course was a bite-sized but intricate dish consisting of a crisp and transparent kimchi-flavoured tartlet with a filing of warm pork belly, kimchi and oyster. 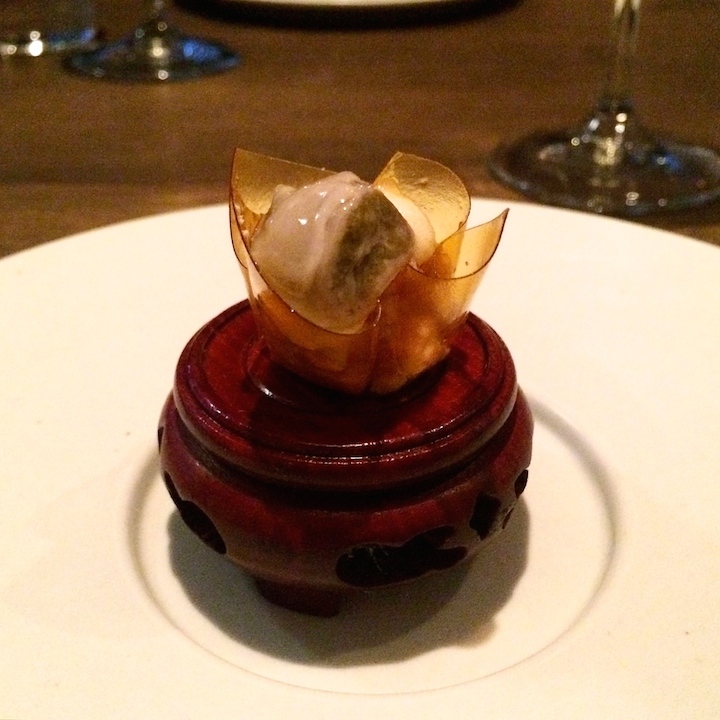 The cool minerality of the oyster delivered a wonderful contrast to the comforting pork, both in flavour and texture. Lovely, mild but punchy flavours from the kimchi. Next to arrive was Benu's homemade sprouted grain bread, served with butter onto which some ginseng-infused orange blossom honey was poured. The combination worked a treat. Shortly after the third course arrived. Creamy potato salad was topped with delightfully crunchy and sticky caramelised dried baby anchovies. A sensational and unique dish with a beautiful textural contrast; first you get the freshness of the (well-seasoned) potato salad, followed by a wonderful crunchiness and sweetness from the caramelised anchovies, and a hint of sesame coming through in the end. Comforting, but incredibly refined at the same time. The fourth course was deep-fried smelt in a perfectly thin and crisp batter, garnished with some horseradish crème and cherry blossom, served on a skewer. On to the fifth course, "Caviar, winter melon, chicken cream". 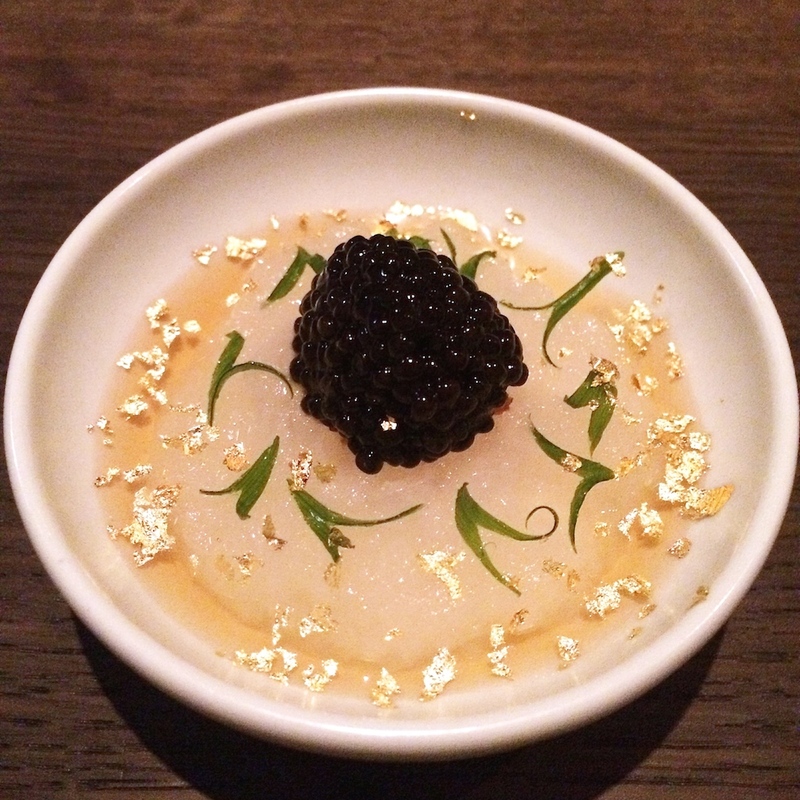 At the bottom of the bowl was a cold chicken cream, topped with a thick and flavoursome winter melon soup, a generous dollop of Siberian sturgeon caviar and garnished with gold leaf. Underneath the caviar there were some delicious onion crumbs. A carefully constructed dish with wonderfully delicate and creamy flavours, the onions crumbs adding a lovely extra flavour dimension and the caviar provided a nice buttery finish. 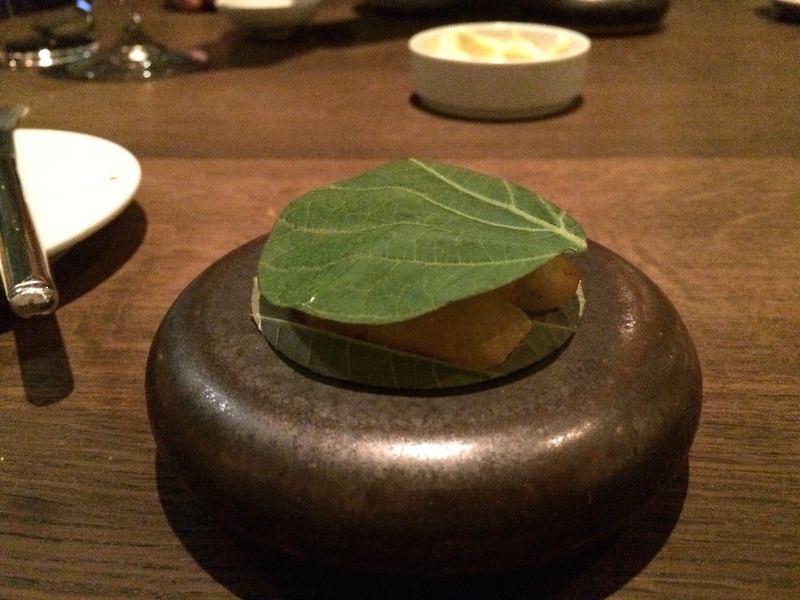 The next two courses on the menu arrived at the same time, one using the green perilla leaf (also known as sesame leaf), and the other using the red perilla leaf (better known as shiso). To start there was a lovely sesame leaf, fluke and daikon sandwich, but even better was the second dish of flying fish tartare served with shiso, radish (cut into a fine julienne), and accompanied by a small bowl with some trout roe. The roe had been marinated in sake, mirin and tamari sauce and was instructed to be stirred in, creating a wonderful marriage of flavours. 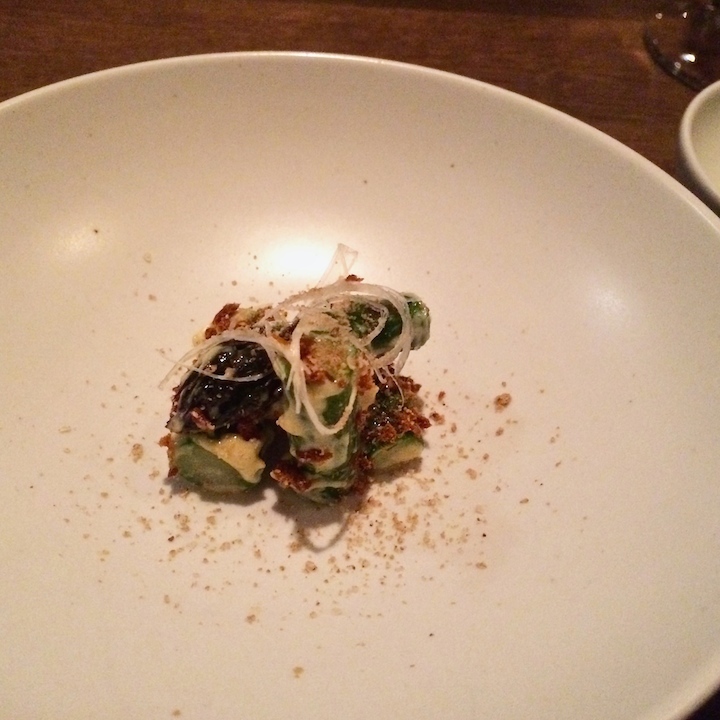 The shiso flavours shone through nicely and the roe seasoned the dish beautifully. Eighth course was a simple but magnificent dish of perfectly cooked green asparagus coated with an elegantly flavoured sesame mayonnaise and sprinkled with some delicious fairy pork floss (Rousong). The sesame flavours were very refined and complemented the aspargus wonderfully, and the pork floss added just the right touch of complexity. Alongside this we were served a delicate dish of light sesame flavoured tofu served with asparagus juice and garnished with an onion flower, the latter adding the a nice hint of sharpness. Both dishes were an unconventional delight. 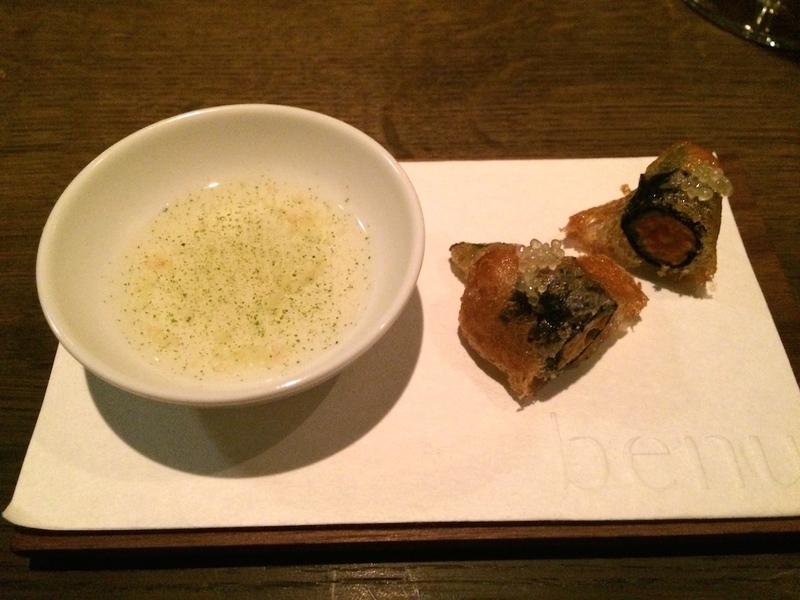 A tempura-style dish of sea urchin, okra and nori followed. The okra was wrapped in nori, coated with a dark golden crisp batter, and contained a wonderfully creamy sea urchin centre. On top of the deep-fried okra was some finger lime caviar and there was a dashi and finger lime dipping sauce. A clever and dressed-up take on deep-fried okra. 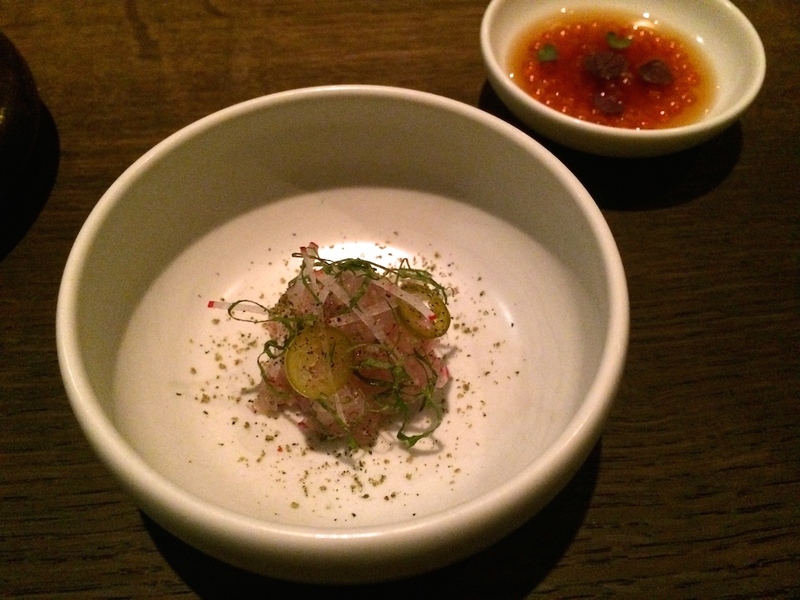 All the individual flavours came through and the sea urchin delivered a wonderful touch of briny freshness. 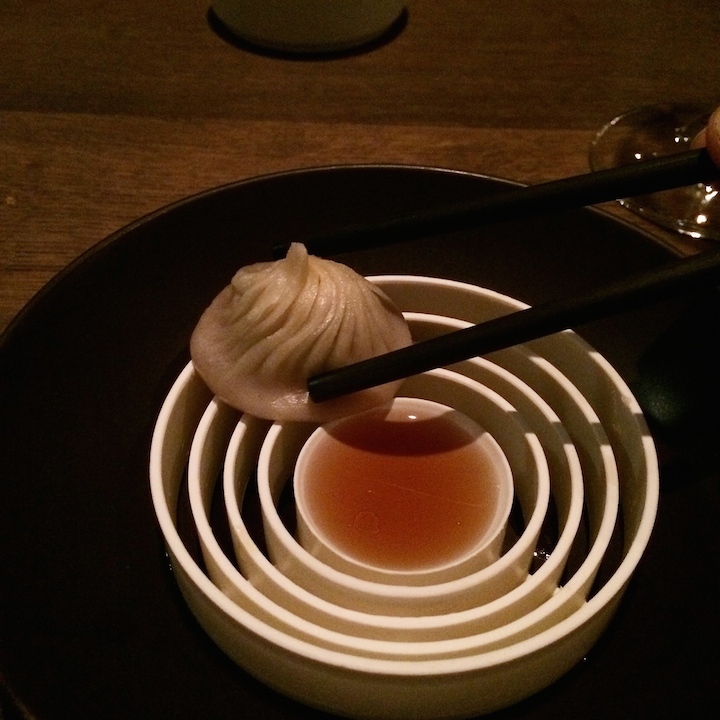 The meal continued with Benu's signature xiao long bao served with aged brown vinegar. These particular ones were filled with foie gras, sausage and a chicken aspic that had melted into liquid stock. A great marriage of ingredients that produced an amazing flavour experience. First you get a little bite from the sausage, then the foie gras kicks in, and the melted chicken aspic creates a nice, juicy and light finish. Great presentation too. Time for the next course. Perfectly tender frog's legs, served with spring onion, mountain yam, celtuce (also known as stem lettuce), and complemented by a delicate broth seasoned with soy, ginger and garlic. These days frog's legs are rarely included in tasting menus, and certainly not in such a wonderfully pure and unadorned way. This was a superb dish with exceptionally elegant flavours, the spring onion giving the dish a nice crisp edge. With the frog's legs came a small bowl of aged brown vinegar for dipping, but I preferred them "au naturel". 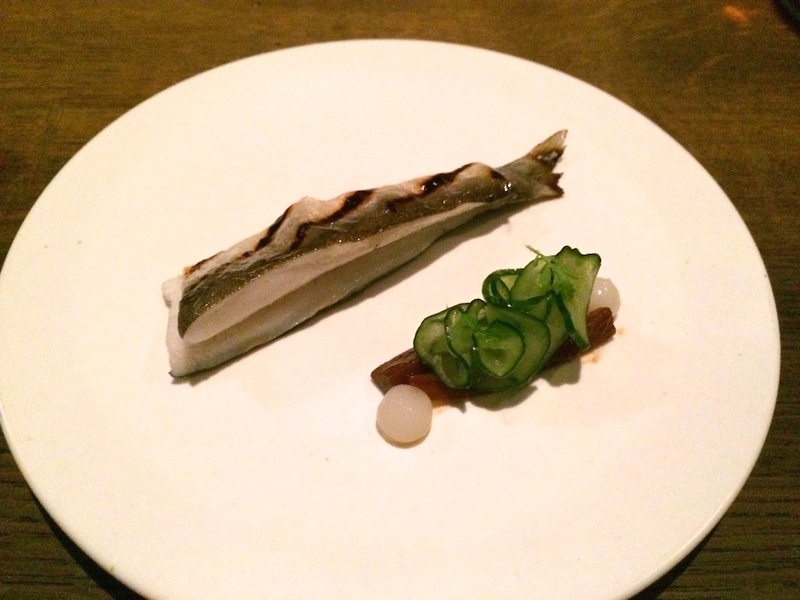 Twelfth course was simply grilled sweetfish (a river fish called Ayu in Japanese) excellently paired with salty pickled cucumbers, pickled burdock and marigold. 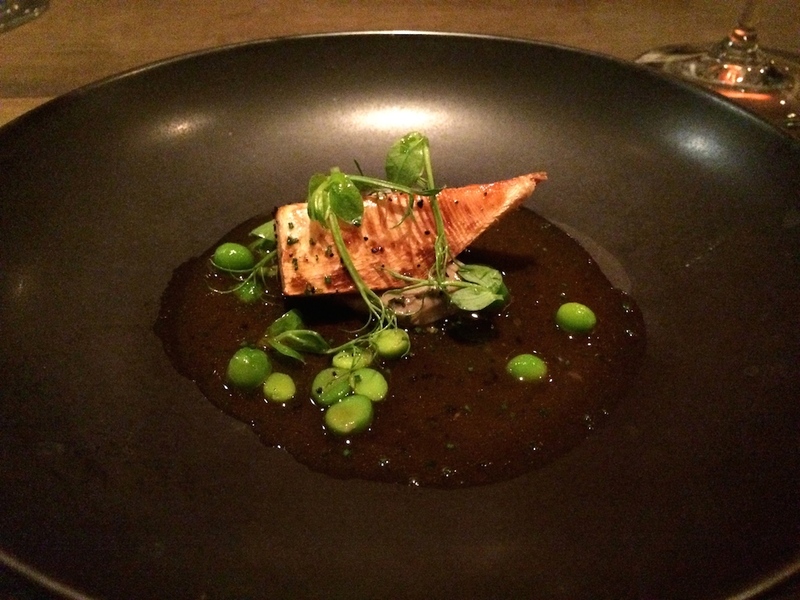 The flesh of the sweetfish was wonderfully moist, the grilled skin adding texture and flavour. Lovely crunch and freshness from the pickles. Equally good was a dish of bamboo shoot cooked "al dente", served with an elegantly rich truffled hen jus and some fresh peas. A delicious truffled and mildly sweet soft bun accompanied by some truffle crème and grated truffle, was served on the side. A delightful dish, striking the right balance between purity and richness. Next up was beef rib, aubergine (eggplant), mustard leaves, charred spring onions (scallions). 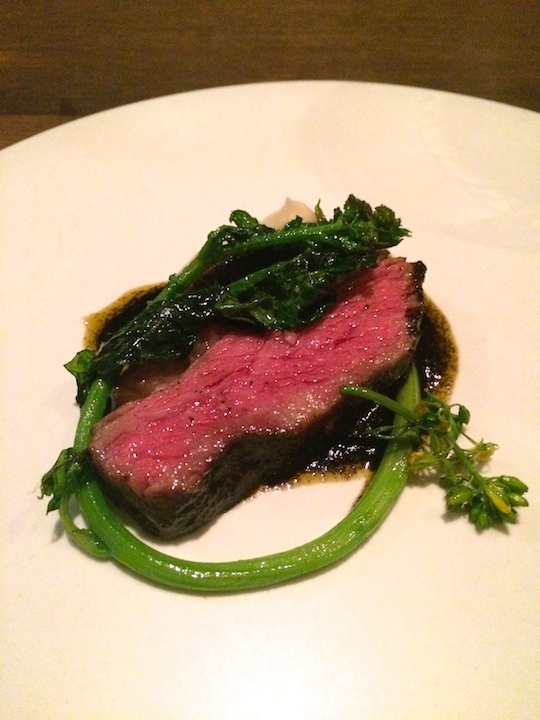 Superbly cooked succulent beef, with a firm and juicy bite, an incredible depth of flavour, and its richness balanced out beautifully by the bitters of the wilted mustard greens and the bitters and the acidity in the fantastic, charred spring onion sauce. Adding a nice creamy contrast was a smooth and delicate aubergine puree. An exquisite dish loaded with flavour. The last course before the desserts was a faux shark fin soup. 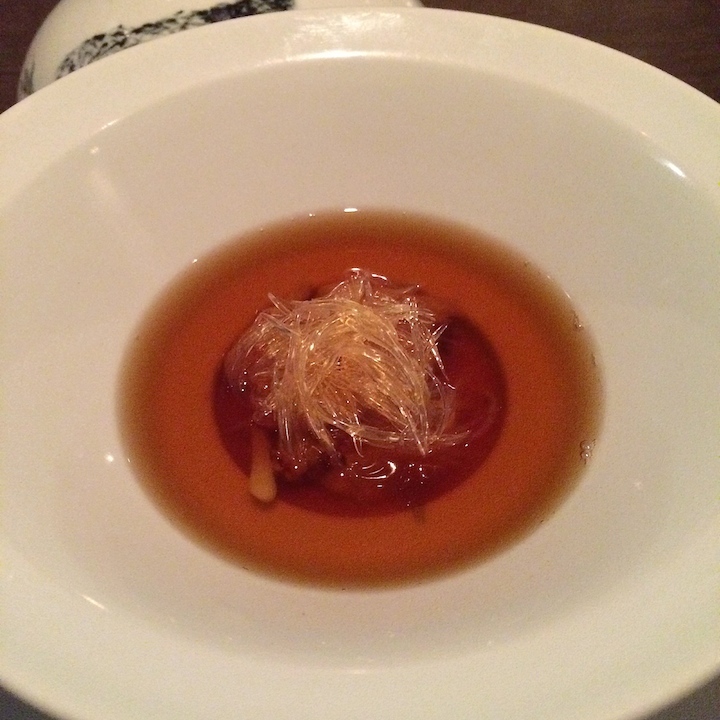 Jinhua ham custard, Dungeness crab and faux shark fin strands, were served in a clear chicken broth, infused with Jinhua ham (a kind of Chinese dry-cured ham). A playful and imaginative dish with a delicate balancing act of flavours and textures. Lovely salty and creamy flavours from the custard and the broth had lovely light Asian notes. Best of all was the crab which was wonderfully moist and flavoursome. Right before dessert we were served some kombucha "tea" made with fermented rice; it had complex dark aromas but was light in taste. First of two desserts was a simple but creative dish of "shaved" frozen milk served with orange blossom honey for dipping. The shaved milk had delicate and pure milk flavours, the honey adding an elegant touch of floral sweetness. 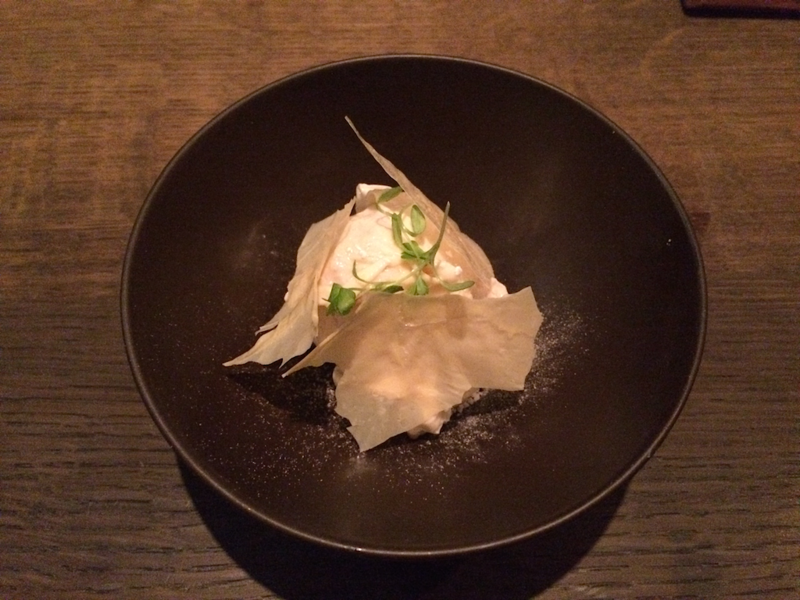 The delicate theme continued with the second dessert: almond sorbet served with pieces of fresh yuba (tofu skin) and crispy dried yuba. 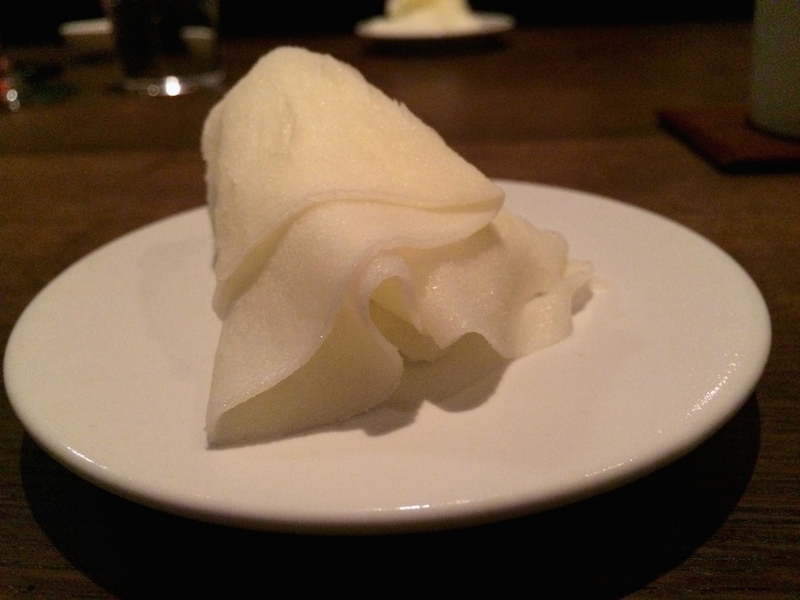 I liked the sorbet, which also had crunchy almond bits mixed in, but overall this dish missed the dessert mark for me. 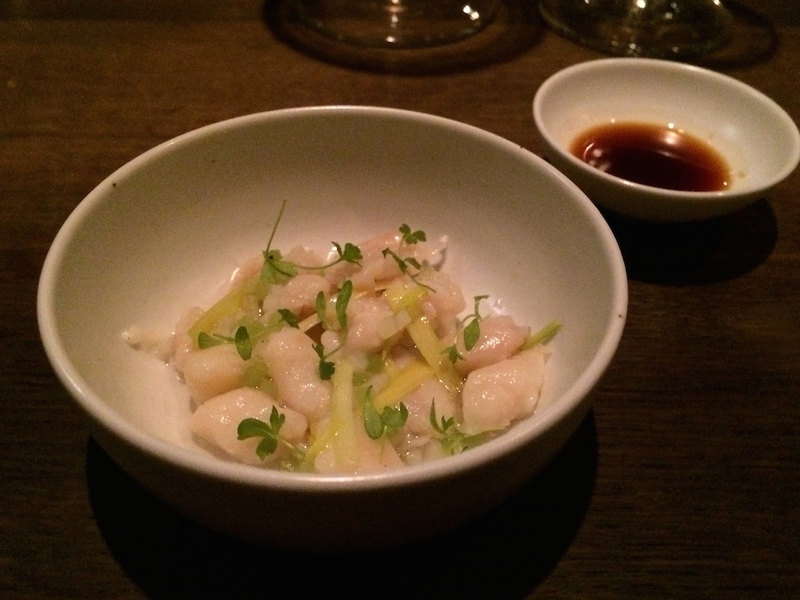 This was my first encounter with Benu and Corey Lee's cooking and I was wonderfully surprised that his food is dramatically different from The French Laundry, or as a diner from Nantucket squarely puts it in a 2011 review on Tripadvisor: "The Frenchy Laundry it ain't". Tonight's meal was a magnificent example of individuality on a plate. Corey Lee delivers modern American cuisine masterfully infused with Asian (mainly Korean) flavours and ingredients, and I salute him for serving potato salad in his restaurant. The well-designed menu was executed with authority and the innovative flavour and texture combinations of the dishes kept my palate entertained until the very last bite. What took me by sursprise at Benu, however, was the slightly formal room and ditto service, but Corey Lee's highly creative food more than made up for that and Benu is, without a doubt, deserving of its new three Michelin starred status.